BRIGHTON, MASS. – Freshman righthander Davis Sharpe tossed 7.0 scoreless innings to lead No. 20 Clemson to an 8-1 victory over Boston College at Harrington Athletics Village on Friday. The Tigers, who took a 1-0 lead in the series, improved to 17-5 overall and 5-2 in the ACC. The Eagles dropped to 11-10 overall and 2-5 in ACC play. Sharpe (3-1) pitched masterfully in a starting role. He allowed just three hits and two walks with six strikeouts in 7.0 innings pitched to earn the win. Eagle starter Dan Metzdorf (2-2) suffered the loss, as he yielded seven hits, seven runs and three walks with six strikeouts in 7.1 innings pitched. Singles by Kyle Wilkie and Bryar Hawkins along with a run-scoring double by Bo Majkowski to start the second inning set up James Parker’s two-out, two-run double. The Tigers stole a run in the fifth inning on a double steal by Sam Hall and Logan Davidson, who earlier extended his hitting streak to 10 games. 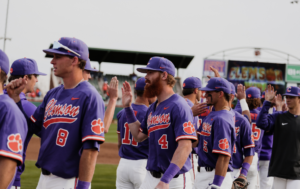 Clemson added four runs in the eighth inning on run-scoring singles by Bryce Teodosio and Jordan Greene along with two bases-loaded walks. Each of Clemson’s nine offensive starters had one hit to account for its nine hits in the game. The Tigers, who upped their winning streak over the Eagles to 11 dating to 2015, upped their school-record winning streak in ACC road games to 12 dating to 2018. The series continues Saturday at 2 p.m., on ACC Network Extra.